I lost track of how many matches I played, and appear to have played my 10,000th match last night. I sure played quite a few. I wanted to record the action in match 10,000. Thanks to the magic of recorded replays, I did figure out which match it was. 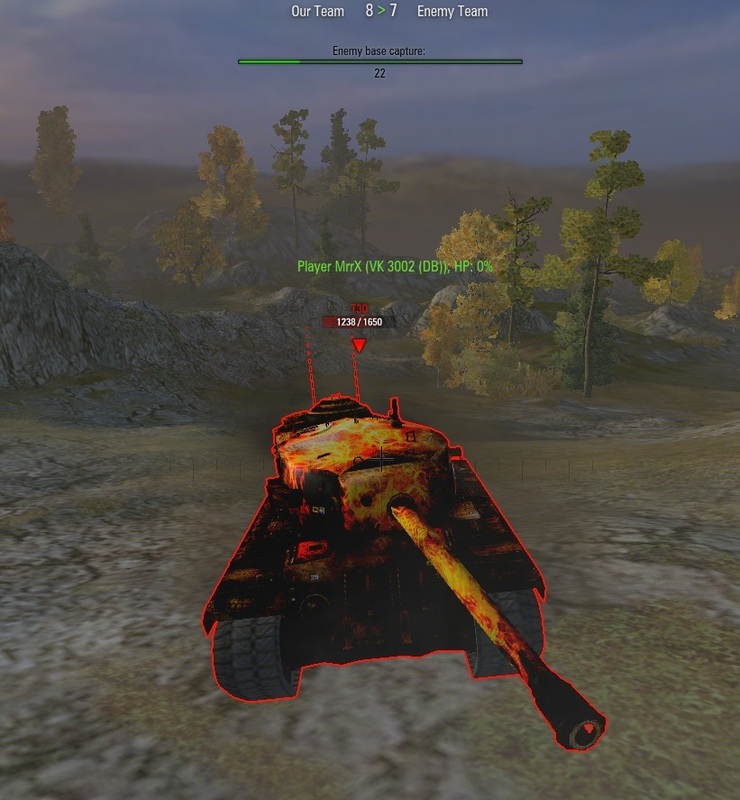 I drove the VK3002DB for match 10,000. 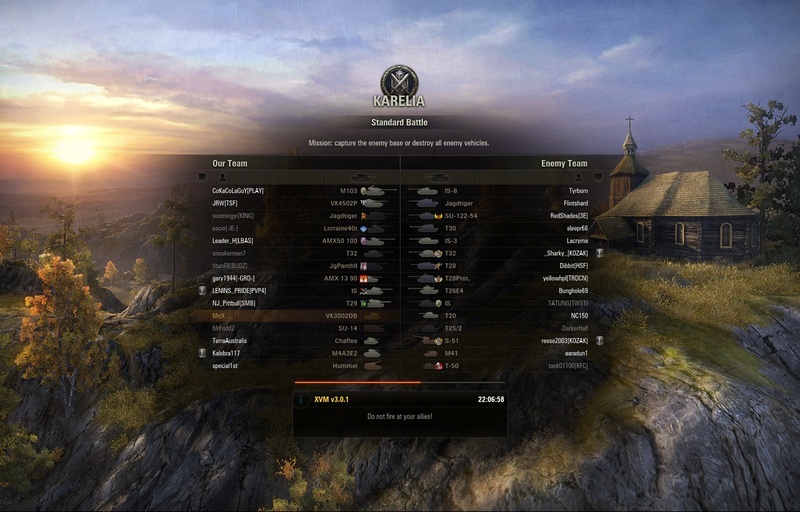 It was Karelia, and I was a low tank in a Tier 9 battle. 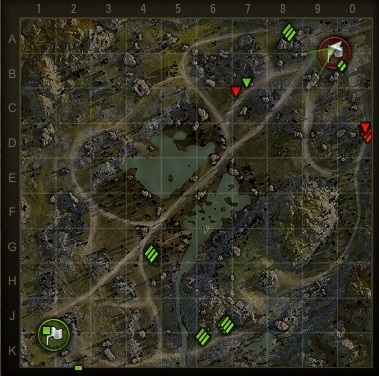 We advanced as this map often goes – nobody up the middle, and left and right advances. They forgot to send anybody left. Fine by me. 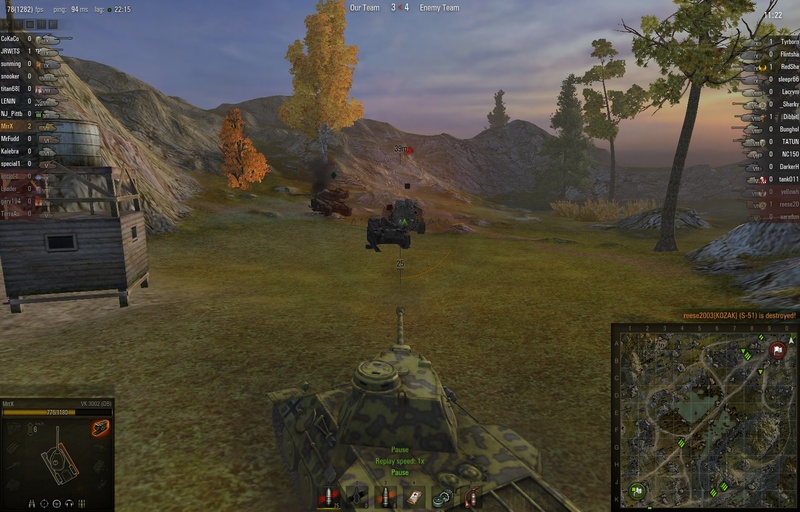 The Chaffee reached the base before me, and banged up the M41. I managed to finish him off, and then wreck the S-51. I thought I was a goner when my sidehug failed. Really, dude, you should have killed me by all rights. Base capture at 48%. But uh oh – look what’s coming up on the right. 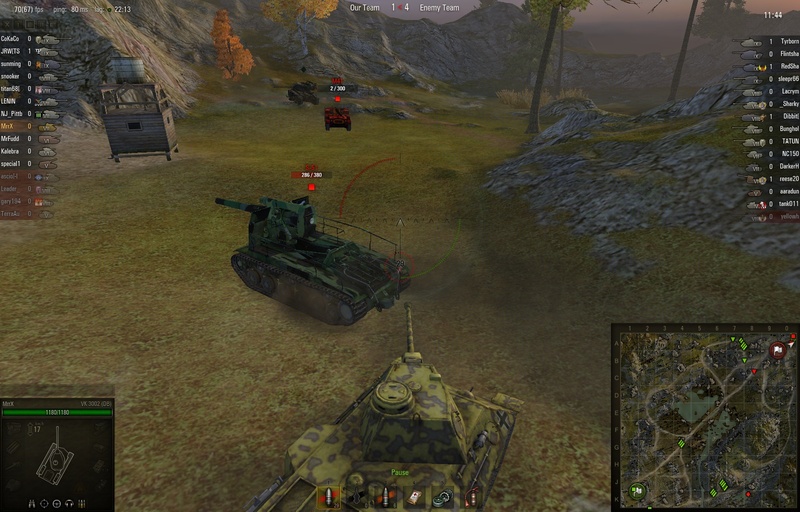 I made the bad tactical decision to bounce around and sit tight, trying to bring in arty fire. They crested the base plateau and blew me up. One shot from him brought me to 0% from 50%. Losing the enemy base got all of our sides attackers killed, and after that they continued the sweep to our base until we were all gone. So match 10,000 was a loss. I reached 9,000 on August 5th, so it took 2 months and 20 days to reach this milestone. Took over 3 months for the last one, so I’m speeding up a bit. In other news, World of Tanks won the Golden Joystick award for best MMO. The promised special is set for next weekend, November 2nd – 5th. 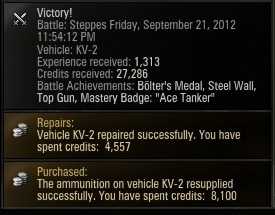 This gives me a week to push total XP earned between free XP, and tank XP, to 168k for the VK4502B. Buying this beast during the special is a 1.1 million credit discount, so it’s a worthy goal to try for. Also plan to buy the Jagdpanther at a 900k credit discount. Got the engine upgrade for the KV-4. I can’t tell you how it drives since I literally bought it the match before writing this. And I’m not driving that pig again until the daily double resets. Will be driving the M3 Lee and M4 Sherman during the weekend event. Need to earn credits as I am about to blow all 8 million, most likely, during the next weeks event. I continue to play Chefville, where I have progressed to the exalted mastery level of 228 stars. Now, they’ve screwed up the game for me. To finish my outstanding quests (3 in total) I am completely dependent on my ability to get potatoes from neighbors. 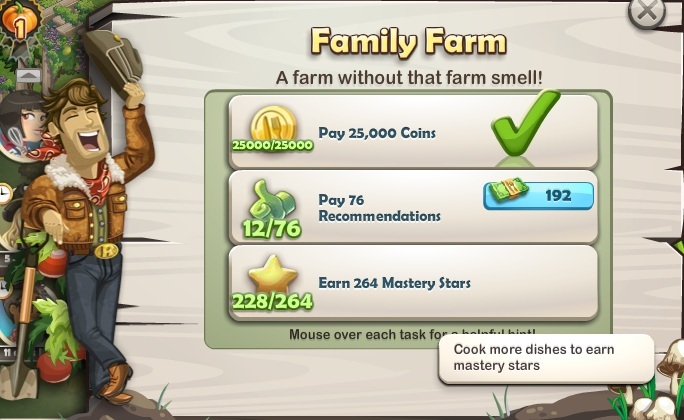 You see, I can’t unlock the potatoes until I get more mastery stars (264 to be exact), and I can’t achieve 264 stars without potatoes. Catch-22. This is not fun. In addition, the graphics engine is screwed up. I get to watch my little guy stutter step through his restaurant, and clicking on anything is a chore. Makes it more likely I’ll just give up and say screw it; although so far, I’ve only logged in to the game once a day while waiting for something to get fixed. Given the recent layoffs at Zynga I might be waiting a long time. Well, what to do then ? It’s interesting to see all the different ways I’m gaming at the moment. I’ll log in and play Scramble with Friends when games are available. (Think Boggle) I have one friend who’s addicted and loves this, and a few others who play occasionally. Sometimes, instead of reading the news in the bathroom, I’m playing there, which gives me immediate additional time for gaming, versus how it was in the past. I reinstalled Life is Crime but the thing crashes all the time and the gameplay can be kind of dumb. I’m mostly just stockpiling cash, because I want to be rich. I play this when I’m the passenger in a car or at other odd times. I have discovered that facebook games are pretty good things to play at the office. I can sneak in a few minutes every so often on my personal laptop. Since most of these games depend on long leadtimes for something to cook/grow/whatever you just time it and see if something is finished, and it’s time to start anew. Of course, this competes with mobile time. The question sometimes becomes, play something on the mobile because it’s my move or because of a timer; or do the PC. Sometimes the mobile wins out. The upshot of all the above is I find myself torn between devices, and games, depending upon my mood as never before. Usually, it would be a question of what do I want to “PC” today. This is an interesting dynamic. After losing a big streak of tanking matches, Chefville tends to get fired up. I might sit for a few minutes outside the office just to work on a location for Life is Crime, even though my kitchen needs me. I don’t Scramble much in the car due to bouncing cars not being conducive to slider phone games. The number of gaming choices we have today is astonishing. VK4502A managed 84k of 168k needed to next vehicle. Halfway there. Jagdpanther is at 57k of 78k needed for next vehicle. Getting closer. 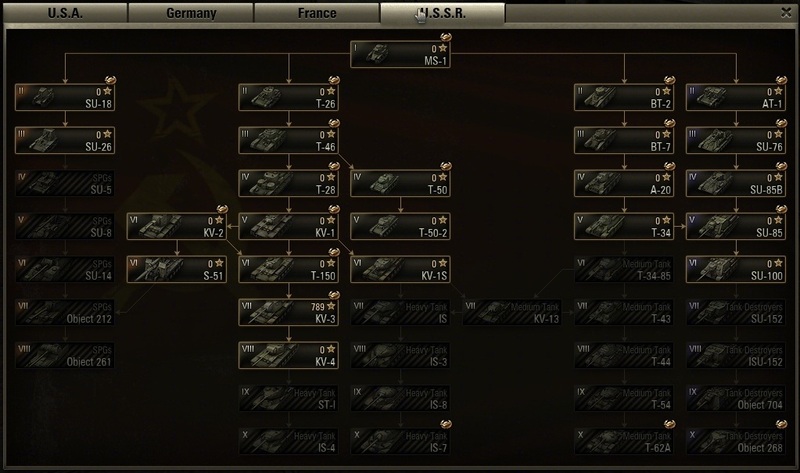 KV-4 needs an ungodly 101k to unlock all modules, currently has 7k. Free XP is too low to really help as well, at 46k. 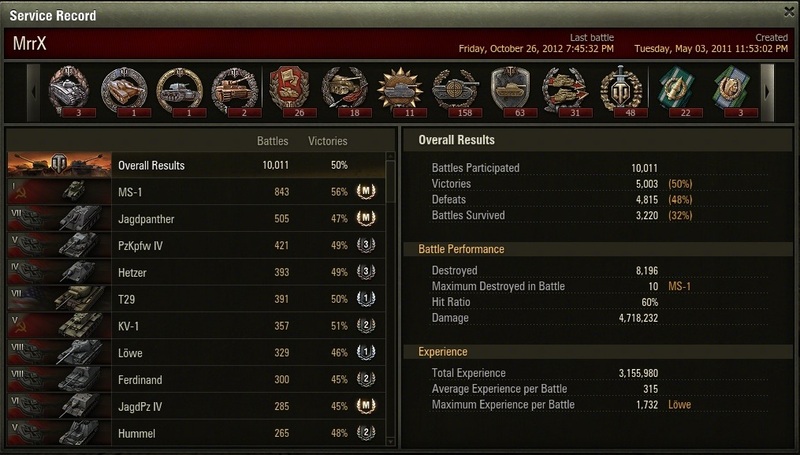 Still playing matches in my KV-3 and KV-2, trying to pass the T1 American Heavy in battles played (184). Not playing my MS-1 since I topped exactly 800 battles. Brothers in Arms at 85%, not active yet, and at least another 100 matches to go I’m sure. The real update is about going down the rabbit hole with Zynga games. I’m thinking, I’m a gamer, I’m good at grinding. How hard can gaining level 15 in Farmville 2 be ? You get a pretty good reward in Chefville if you do ! It turns out it’s a lot harder, given a deadline of 10/8/12, than you would think it would be. At least, if you want to continue to play Chefville, where I have reached several meaningless goals of being able to cook more food but still find myself having a lot of fun. Well, as of tonight, I pledge not to play any more Farmville 2 and will stay at level 10. I had been staying away from Facebook games as the quality and attraction was known to me, for pretty much all of them. Then Zynga went and improved on things. One really smart thing they did, was find a way to let me stay logged on forever and continue to play. Run out of energy ? Visit neighbors. Want some salt – a key ingredient to continue playing ? Visit neighbors. Need some ingredients or energy ? Monitor your newsfeed. Sit around and wait for that timer – only 1:30 to go until you can once again cook beef broth. And the real insidious thing – just wait maybe an hour and a half. All your energy is regenerated, time to play again. And chase all the timers once again, making not only finished food to serve, but intermediary foods, lots of which take more raw items to make than makes any sense. There’s still an element of fun to it, which presents a dilemma. I want to continue to progress in tanks, and I also find, having gained the amazing skill level of 168 at cooking dishes, that I don’t have anything more than that I can point to as accomplishing. Sounds dumb right? And yet, I’m still playing and will continue. Parents, make sure and be aware of the Zynga games because you will be dealing with this when your kids get to the right age, if they aren’t there already. And you may have to look in the mirror, even as a lifelong and avid gamer, and for the first time say “Enough. I won’t play that game” because you are being stupid about it. The gaming continues. Having another fantastic match, sure gives you something to write about, but I’m getting ahead of it all. Life Is Crime is now reinstalled on my mobile. It’s a simple way to pass the time if you need it, and only the mobile is available. Scramble with Friends has replaced Words With Friends for a mobile game, which you actually play against someone. Chefville got the required 121 stars out of me, to upgrade and have more ingredients available. Did another group of quests and am now stuck waiting to get….. 131 stars. The treadmill continues. Well, I have to admit it’s still fun. One interesting aspect about playing Facebook games. Women play them. And you never have enough friends to do well, so you find yourself friending people just to have them as neighbors, that provide bonuses. And thus, my friend strip looks like the below. Now, just need another 2.6m credits and lots of free XP. Seven kills, five of them with no help. It was a match on the Steppes. XVM informs me I have a 5% chance of success, and I look at the composition of my team. I am the only one who’s not red in the top ten tanks. The other guys have four players with over 10k matches against me in my 9k. Sounds like things will be going well ! They sure started bad. My team hardly realized that the thing to do is go north to the enemy’s start point. Me and a VK3001P move that direction and find four or five enemies in there. He gets killed quickly, so its just me against the enemy. One after another, I wipe out four of them. Things go pretty well on the field for supposedly having an awful team; I look up, and find out that it’s me and an M4 against 3 of them. They’re capping, and I’m on the opposite side of the field. I begin moving my lumbering behemoth, and bless him, the M4 manages to reset the cap and die, just as I kill off a PZ4, then a T14. It ends badly for the Grille, who resets my capping, but can’t seem to damage me, he just tracks me. Now that was fun ! And once again I’m playing a facebook game. With all the usual intensity shown towards anything grindy. I give you, Chefville. For some reason I have quite the affinity to these cooking games – even though, in real life, I never make anything more complicated than TV dinners. 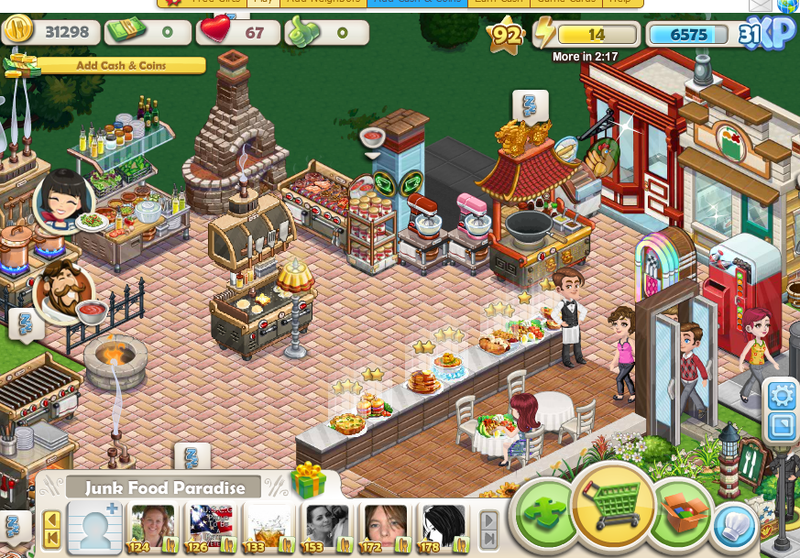 Thus my restaurant’s name – “Junk Food Paradise”. The game rewards you for having neighbors, through by-passing the “wait for your energy to recharge” mechanic, and harvesting items from them. This, of course, means you post your name to one of the many “!!! ADD ME!! !” groups and friend a bunch of strangers. I think I have about 75, and perhaps 5 people from my “Real Friends”. You start out with a little restaurant and decide what to cook. But it quickly becomes much less about cooking. Why ? 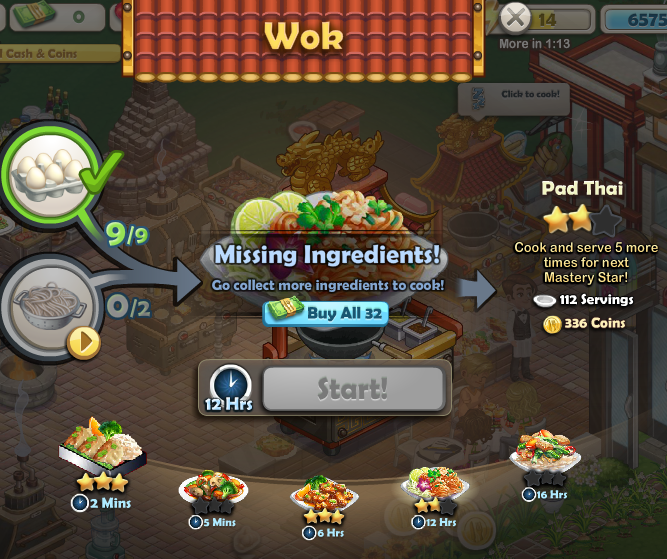 The lead-me-by-the-nose quests continually require you to have stars, which are earned by cooking dishes a certain number of times. What once was a mechanic added for fun, becomes in this game the essential progression mechanism. Want a new cooking station ? Better get some stars ! Your level seems to function only to recharge your energy. It is nothing but a blast anyway. I madly collected all the different ingredients and cooked everything I could manage. I expanded my restaurant and completed the quests. I wouldn’t stop playing to log in to World of Tanks. Instead I stayed up all night managing timers – neighbor visits, ingredient regens, and dishes finishing cooking. And the critical inventory size limits too – can’t have more than 15 wheat breads in your inventory, while some recipes require a bunch. But needing to grind up stars leads to having to “finish” all the recipes. And they start out seeming sensible – Make hamburgers ? Have one meat, and one bread. Then the inevitable need to prolong the grind just starts making less sense. Want to make chicken broth ? That’ll take 5 chickens – the same amount required to make orange chicken. I may be a lousy cook, but something’s off with that ratio. And my favorite is pad thai. With all of this I find myself keeping it running while I have a spreadsheet or something else in the background, so it’s a fun diversion. As always, the ability to pause is a big plus. If anything, it’s even an advantage – I will regenerate without waiting so much ! And as usual, I refuse to pay real money for a Zynga game making it a simple and free thing.